Project Icon Set contains 18 beautiful icons related to project management. The set includes the icons address card, bar graph, calendar, clock / time, conference device, contact, documents, draft, mail, marker, milestone, notes, portfolio, project plan / gant chart, search / find, sitemap / flowchart, todo and user / resource. The files are transparent PNGs, and vector Fireworks source files are included as well. As always, the set is completely free and may be used for any private or commercial project without any restrictions whatsoever. 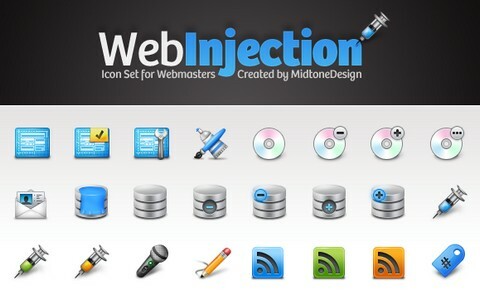 WebInjection is an Icon Pack for webmasters and web developers. The set includes 26 stylish icons, each icon is a .png at 48×48px. It is free for use in your personal and commercial projects, and can be used without attribution. This icon set is created by Midtone Design Studio, you can view his another Icon Pack – Colorful Mania Iconset as well. Susumu Yoshida is a visual interface designer in Japan. He has created a set of iPhone style sidebar icons for us. They are 16px icons in PNG format. Of course, it is not restricted to use these icons on your sidebar. If you think it is suitable to use them on your blogs or web applications, you are free to do so as well. In web forums, instant messengers and online games, text emoticons are often automatically replaced with small corresponding images, which came to be called emoticons as well. Examples of widely known emoticons are the smiley face : ) and the frowny face : (. We have selected the best 5 sets of emoticons we have found on the internet. You can use them on your blog, forums and even web applications for free. Please feel free to suggest your favourite ones we did not mention. Jonatan Castro Fernández is a spanish freelance graphic and interface designer who lives in Ourense, Spain. He has been designing for a few years and now he has started his own design studio called Midtone. He has released a set of 32px mania iconset which is absolutely free. You can use them on your website, web application or whatever. You can download the iconset directly here. Would you like some glossy modern web browsers icons? J.max from Morcha has designed 9 glossy modern browsers icons including, Internet Explorer, TheWorld, Opera, Safari, Firefox, Netscape, Tencent Traveler, Maxthon and Google Chrome. All of them are in the size of 256x256px in Ico and Png format. The site is written in Chinese, you can download the file directly here. SmashingMagazine has released Fresh: an application and financial icon set. This icon set is a fresh and lively collection of 59 high-quality stylish icons in standard sizes ranging from 16×16 to 256×256 pixels. All the icons included in the set have a clean, modern look and have consistency and harmony in both perspective and color. There is also one vector file containing editable EPS icons that can be rescaled to any size while retaining their original detail. You can use the set for websites, web applications, desktop applications or anywhere beautiful icons are essential. You can use the icons for private and commercial projects, blogs and web-sites for free, without any restrictions whatsoever. A while ago, we have introduced 220+ Glossy Flag Icons in PNG format, Bartelme Design Flag Button Devkit. If you are looking for mini flag icons, you should visit FAMFAM Flag Icons as well. Many websites / web applications have different versions for different countries, and some of them support different languages as well. I am sure a set of flag icons / pictures can help us so much. Now we can create our own set of flag icons for our websites / web applications, because MSN Multimedia Center provides us a set of flags, including 192 Countries, Canadian Provinces & Cities, Islands and U.S. States, Territories, & Regions.